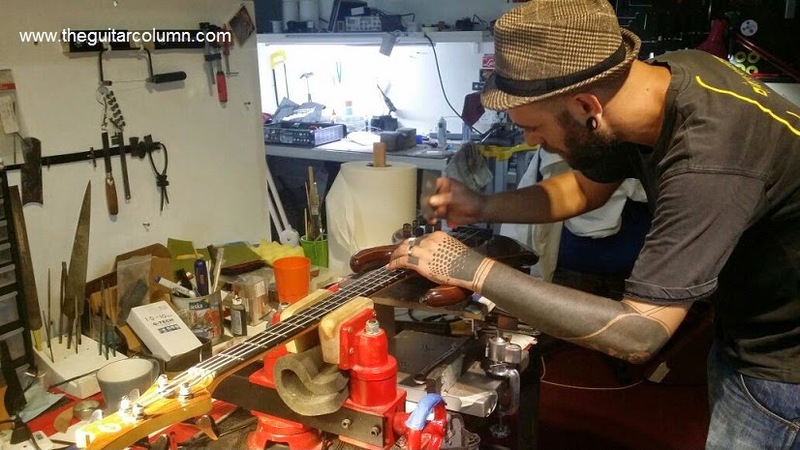 Born in Milano, Italy, 36-year old luthier Luca Quacquarella is a man on a mission -- to spread the gospel of fine guitar repair. And if there's anyone that could raise a guitar from the dead, it's this guy. Classically trained in violin, cello and doublebass luthiery and repair, Luca arrived in Singapore in 2011 while on a holiday and sightseeing trip. Curious about the local guitar repair shops here, he paid a random visit to one and struck up a conversation with the owner. If you have been following my posts on Refinishing My Les Paul BFG Parts 1, 2, and 3, it gives me great pleasure to present this interview with the man behind that project. 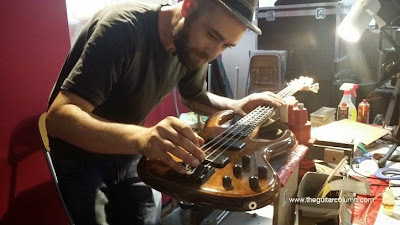 The Guitar Column: Thanks for taking the time out to do this interview with us, Luca. Luca Quacquarella: Thanks for the opportunity to work on your guitar, to spray and to do it in a cool color. TGC: At which point in your life did you discover that you had a passion for luthiery? Tell us about your luthiery apprenticeship in Italy. LQ: After I finished my studies in university -- I studied sociology, mass media and public relations -- I realized that it was not for me. At the same time I was studying, I started to play bass and drums. It was just a coincidence, but one day while I was on the internet, I found this luthiery school in Milano, which was a four-year course. For the first two years they taught you how to build parts of the guitar, then over the next two years you learned how to build and put together all the parts. It was not too expensive, in fact it was quite cheap, but it was far from my hometown so I needed to find a job to support myself. But the school was fulltime -- you had to bring home pieces of a project and keep working on it -- so I couldn't work to make money to survive, so I had to give up. I was a bit depressed. Because, now what? Luckily I found, not far from my hometown, a German luthier, Felix Habel. This guy graduated from a school in Cremona..
TGC: Cremona is where those Stradivarius and Guarnerius violins came from. LQ: Yes. This is one of the most famous luthiery schools in the world. But to join this school, you have to speak Italian, but there are students from all around the world -- Chinese, Japanese. It is a secondary school -- you had to study all the normal subjects on top of luthiery. I approached this guy who had graduated from this school and he had opened his own shop to build violins and violas. I asked him, "What if you teach me?" I told him my story, what I'd like to do. Luckily I had my very old guitar, a Framus, my father's guitar from the 1950's, in bad condition. So I asked him if I could come and I would work on my guitar. From that moment, I stayed with this guy for almost three years. I didn't pay him, but he also didn't pay me. He had many orders for custom violins and a few projects to build electric double basses. I started with simple stuff but eventually went on to build six or seven electric double basses from scratch. I also built resophonic guitars. TGC: How did you find the materials to build resophonic guitars, the cones and the metal parts? LQ: The metal parts you could buy and all the woods we used were from Germany. But even in Italy now, you can still find good wood. TGC: How much of your classical building technique do you apply to your current repairing of guitars? LQ: One little example. The nut of any string instrument, I follow how it should be done, exactly like how you would do it on a violin. How the string must sit properly in the nut; how deep, how far the top of each string should be above the nut. The string should move nicely in the nut. It's a little thing but very, very important. TGC: What is your opinion on current guitar manufacturers, for example Gibson and Fender? What is your opinion on the quality of the guitars that they are making? LQ: It's mass production. The first thing I can see, under a little light, is how they put a guitar together. They don't pay attention to a lot of details. It's not too small -- if you have a little knowledge of the guitar, you will notice. Sometimes it's bad. TGC: How about the quality of the woods you see on the modern instruments? What is your opinion of the types or grades of wood that they are using? LQ: One thing I always tell people is that if you buy a solid color guitar, you can forget about the guitar having nice wood underneath! These big factories, they have stocks of wood so huge -- they buy tons and tons -- so there is no chance that they will be using old wood. I mean, my bass that I built is 40 year old mahogany. You can still find old wood, but you need to go and search. TGC: We are not exactly talking about a visit to the lumberyard here? LQ: No, no. We look in woodworker's shops, where they build tables, chairs. TGC: After all this talk of woods, how much does the pickup affect the guitars tone? If a guitar has lousy woods, but if you put a great pickup on it, will it help make the guitar sound better? The guitar sounds better not just because of the wood and the pickups. It's the flow of the guitar. It happens sometimes that you have a cheap guitar, but when you play it, it sounds good. To answer your question, it's 50/50. The pickup is important and the wood is important. The density of the wood changes the tone. TGC: How about the guitar's finish? Do you think guitars should be finished in nitrocellulose lacquer all the time? LQ: All the time, nitro for sure. Spraying nitro is not too easy. Spraying a poly finish is easy. Spraying nitro may take double your time. TGC: We are talking about seven coats of nitro to get a smooth finish similar to a thick coat of polyurethane? LQ: Usually with nitro, ten coats is considered a thin coat. It depends on how you set your spray gun, but usually it's ten. TGC: Tell us about the line of guitars that your company is coming out with very soon. What type of models can we expect and what are some of the different options you offer? LQ: Basically, I'm an old school guy, I like old school stuff. For now, because it's more easy to do, we plan to do guitars in the Fender style. Classic but more modern. For sure we'll change the shape of the headstock. But most importantly, we'll take care of the little details. TGC: And the finishes will be all nitrocellulose as well? LQ: All nitro. I can use only nitro. TGC: Do your customers get to choose the type of guitar pickups they want, choose different types of wood, different neck shapes? LQ: Neck shape, of course, it's the most important. The wood you can choose, and you will get to choose pickups also. If you come to me and you are not sure what pickups you want, I will try and help you. I have an idea on how to demonstrate different types of pickups on the same guitar. TGC: Luca, thanks a lot for doing this interview! LQ: Thanks for interviewing me!